Clearly, tapping into pay-per-use cloud platforms like Microsoft Azure can save you significant money – but are you really getting the most from the new economic model? According to cost optimization tools like Cloudyn, around 70 percent of you are not. The culprit more often than not is what we might call “traditional” thinking – and it’s costing you! New to the cloud? You’re probably already reaping the immediate gains of faster time to deployment, self-service access for developers and the ability to scale up your solutions when demand grows. These are the core fundamental values of leveraging automated infrastructure- and platform-as-a-service solutions. If this sounds like your organization, feel good about what you have done as these are the initial benefits from cloud computing. It’s a great start. But are you really getting all the economic benefit from the cloud that you can? Perhaps not! Think about, for example, when your applications experience demand. Few applications run at a steady workload. Many of your applications are no doubt seasonal: experiencing heaviest load at certain times of the year, say, at month- or quarter-end, or, like e-retailer Jet.com, around holidays. Some are growing quickly. Others are only available at certain times of the year, and still others are just plain unpredictable. Consider as well the “traditional” best practice of capacity planning. Seasoned CIO’s have a rule of thumb that you calculate – as best you can – the maximum load, and from that the number of instances/servers, and add a fudge factor, say, 20%, the hope being that you don’t get called on a Friday night when the load unexpectedly spikes. important thing, from an economic point of view, is to be attentive to scaling down, to releasing instances and thus reducing charges. You shouldn’t pay for what you don’t need or use. With Azure, you can configure your application to automatically scale up and down, or you can schedule additional instances when you expect a heavy load, releasing them when no longer needed. Next, think about componentizing. For example; nearly every enterprise application has a Web-facing front end, some business logic, and a database. In the cloud, each of these can be scaled independently. With an effective caching strategy, that is, keeping frequently used data in memory or otherwise readily available, you may be able scale up the front end as user traffic grows while not having to scale the business logic or database server as rapidly – thus intelligently managing cost while at the same time providing a superior experience to users. Want to do seamless upgrades? Consider taking advantage of Azure’s geographical reach. Marketing agency Hogarth Worldwide shifted data traffic between data centers while uploading new videos and code, thus preventing any interruption to their clients’ businesses. How can you optimize your cloud deployments? 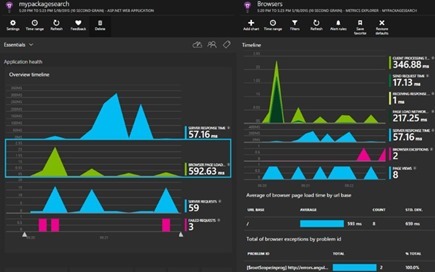 Think about using tools – like those from Cloudyn, CloudCruiser, or Microsoft’s own Application Insights (shown) to understand and optimize your cloud deployments. Such tools allow you to see how your money is being spent and show you possible areas for savings. It’s been said that smart CIO’s approach their cloud with their eyes open, and that’s true. But a prudent approach, with an eye toward all the numerous opportunities for cost efficiencies available in the cloud, will reap rewards for years to come.